STI hit a high of 2827 on Thursday but succumbed to selling pressure to close at 2802 on Friday. Going towards the end of 2009, the index looks to be consolidating at current levels. 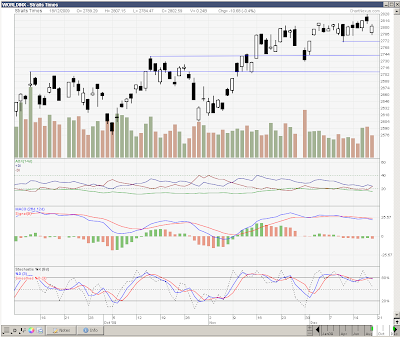 The technical picture shows the MACD indicator below its signal line which is a bearish signal. The ADX has fallen to around 17 which correspond to the weakening of the uptrend. 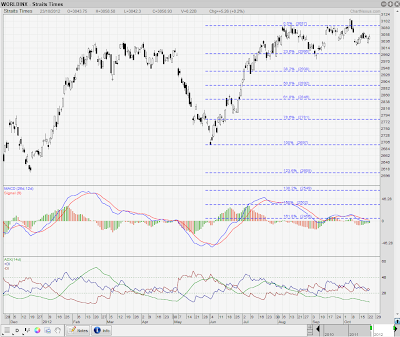 Short term stochastic is also giving a bearish signal and points to short term weakness. Support is at 2770 and 2740 respectively. The break above the strong resistance at the 2700 to 2730 range is still valid. This indicates a target of 2900 which looks attainable. Key benchmark is likely to extend gains after a four-day break on optimism over the global economic recovery and robust December quarter earnings for domestic companies. Volatility may remain high on the bourses as traders rollover positions in the derivatives segment from December 2009 series to January 2010 series ahead of the expiry December 2009 contracts on Thursday, 31 December 2009. According to data released by the NSE, in the last session, FIIs were sellers of index futures to the tune of Rs 271.7 crore and sold index options worth Rs 336.89 crore. They were net sellers of stock futures to the tune of Rs 290.6 crore and sold stock options worth Rs 0.55 crore. Key benchmark is likely to open positive after encouraging economic data from the US and gain in the Asian markets. However, market may remain volatile ahead of the expiry of December 2009 futures & options contract today. Meanwhile, domestic stock exchanges will stick to their decision to start trading 55 minutes earlier than the current opening time from January 4. The BSE & NSE exchange would open at 9:00 a.m. from Monday. According to data released by the NSE, in the last session, FIIs were buyers of index futures to the tune of Rs 43.98 crore while sold index options worth Rs 223.61 crore. They were net sellers of stock futures to the tune of Rs 93.3 crore and sold stock options worth Rs 5.44 crore. All posts are written strictly for educational purposes. It should not be viewed as advice to buy or sell certain stocks. Note that the stock price data is based on freely available sources and investors should do their own research before committing to any investment or trades.